Welcome to the Top 5 for this week, thanks for joining us. This week we return to a more familiar format with the good, Bad and Ugly, grade our teams, look at what (if any) impact the changes to Super Rugby have made to the Aussie teams and ponder popularity. Plus there are some highlights. We like highlights. Good – How good is it to have a season where the top 8 aren’t decided weeks out from the finals? Going into the last round only 2 matches really don’t have anything riding on them. Plus people are still saying the Brumbies could make the finals (personally I doubt it) but the fact that so much could change in the last round definitely makes it a little more interesting. 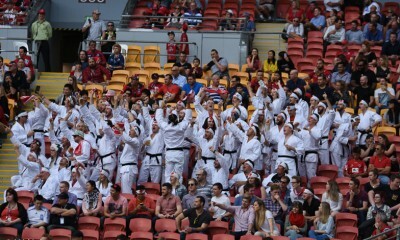 Bad – The final call of knock on during the Chiefs Brumbies match. Now before you get your knickers in a knot, no I am not about to complain about the ref. I am about to complain about the people that complained about the call (which to be honest isn’t as many as some would have you believe). Yes, the call looked to be wrong. No I don’t think the TMO should have intervened, hell, could you imagine what would happen if they started butting in for every wrong knock on/forward pass etc? But no, I don’t think the call cost them the game. 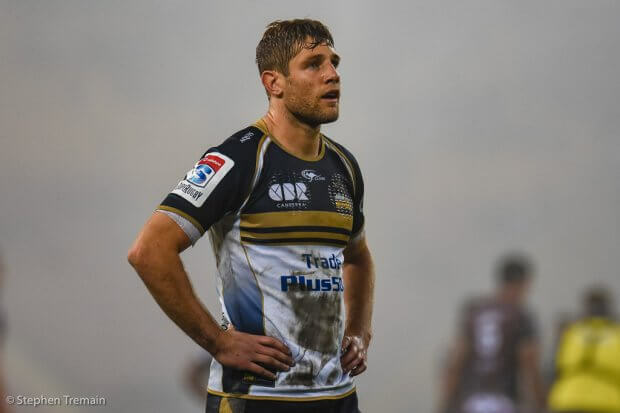 Sure, the Brumbies may have been able to go on and win but they are the ones who put themselves in the position of needing that call to be right in order to have a chance at winning. If they hadn’t knocked on earlier in the match while crossing the line, if they had made more tackles, if they had supported more in attack at the breakdown, then that last call wouldn’t have mattered a bit as they would have already had the game in the bag. And then there was this. Is it desperation for a headline, poor wording or just a complete lack of understanding about how upset Brumbies fans were. Either way, this tweet (while listed in the bad) made me laugh! Ugly - Jack Maddocks’ hair cut. I mean seriously, WTF was he thinking? Reds B Not a perfect game, but I thought they played pretty well against the Rebels. Their scrum was, as expected, outstanding and they used the ball pretty efficiently. They handed the Rebels some opportunities through poor lineouts but also got lucky as a result of some poor play by the Rebels. Rebels D They just didn’t look that good. There were numerous poor passing options taken, dropped ball and poor kicking. There was also some questionable decision making happening, whether it was coming from the coaches box or the captain/playing group, the choices around when to kick for goal and when to kick for touch seemed to make little sense. If they do make the finals, they will need to lift their game drastically. Izack Rodda scores off a chargedown of a kick from Jack Maddocks. Brumbies C- The last 20 minutes showed, like last week, that they can play. But the first 60 was pretty terrible. They butchered a few scoring opportunities, were outplayed at the breakdown and were falling off tackles. Once some of the subs started coming on (Hawera had a good stint) and they started finding gaps rather trying to bust tackles, they really challenged the Chiefs. A pity it came too late to get them the win. Waratahs A They won, record margin, huge blow out etc etc. But until the red card to the Sunwolves the Tahs actually looked to be under a bit of pressure. Don’t get me wrong, I never actually doubted that they were going to go on and win it and give them full marks for taking advantage of the extra man, not relaxing and absolutely annihilating the Sunwolves. But for an A+ it needed to be against a 15-man team. At this point last year we had just watched the final round of Super Rugby and were heading into the finals. Remember, this year there is one extra game. So lets just ignore the final round and have a look at how we stand this year compared to last year. Changed format, changed teams – what has it all done for the competition and Aussie rugby? Well obviously the Rebels. Apart from inheriting a substantial number of players, a coach and support staff, their results have improved drastically on last year. They have a W/D/L record of 7/0/8 compared to last year’s 1/1/13. But when you add in the Force’s record from last year of 6//0/9 it kinda equals out. The results of the Rebels basically reflect the combined results of Rebels and Force from 2017. The Waratahs and Reds have improved their win rates as well, while the Brumbies have stayed the same. The Sunwolves are doing slightly better as well, they have won an extra game and are looking more competitive. The Jaguares have also improved their wins from last year, from 7 to 9, but I think that has more to do with them finally playing like the mostly National team that they are rather than the change in format. 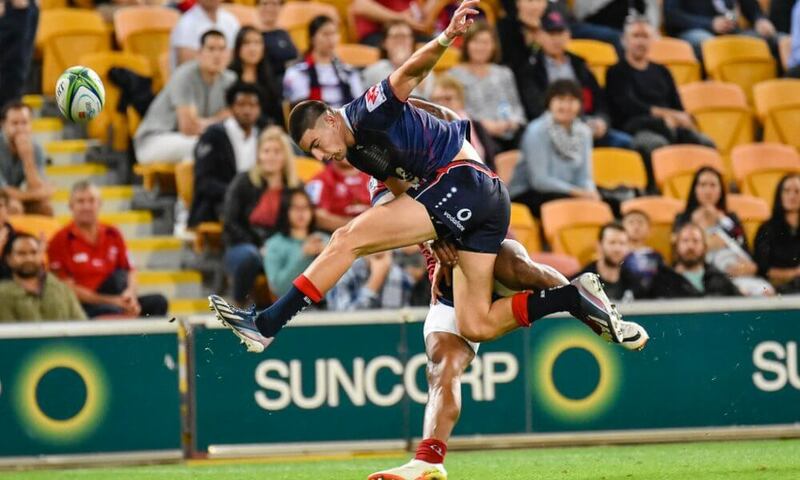 Ignoring the Jaguars and Sunwolves, let’s look at the Rebels. Is their drastic rise proof that we are stronger as 4? On paper, yes it is. We have won more games as a conference, we have won 3 games against teams from NZ and there is a real chance of having two teams in the finals – all of that points to a huge improvement. Right? Well, let’s break things down a bit and see. With the 5 teams in 2017 we played 75 matched. We won 21 of those. Of those 21 wins, 15 came out of Australian derbies, with 4 wins over South African teams and 2 over the Jaguares. None of our teams played the Sunwolves last year. In 2018 with 4 teams we have played 60 matches and won 27 of them. 11 of those have been in Australian Derbies, 3 over kiwi teams, 6 over teams from South Africa 1 over the Jaguars and 6 over the Sunwolves. So the majority of our wins are still coming over Aussie teams, but this year we have picked up a bit over the other countries. More evidence for a better year. Taqele Naiyaravoro getting some attention from Debrecini and Genia. So yep. We are definitely better off with 4 teams over 5. 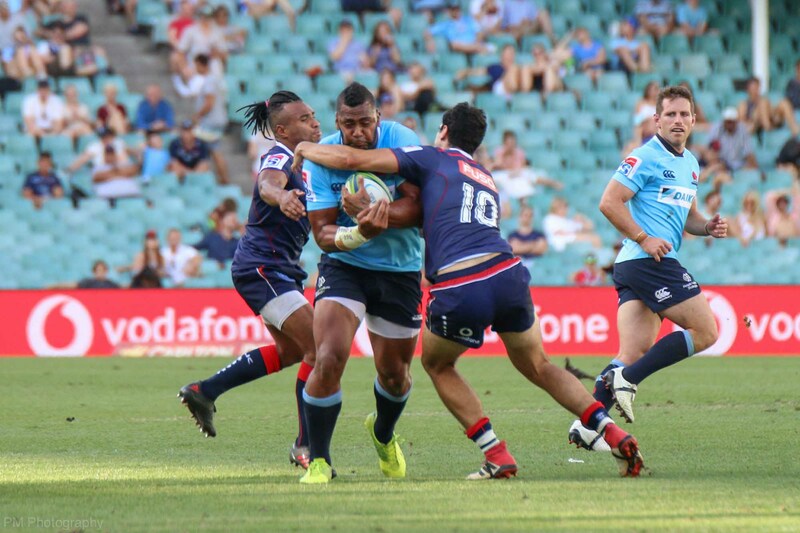 The Waratahs are about to finish 2nd on the table while the Rebels could finish 8th. Right now they have 9 and 7 wins each. 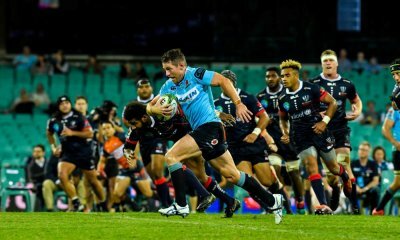 Of those 9 wins for the Waratahs, 5 have been against fellow Aussie teams and 2 against the Sunwolves. 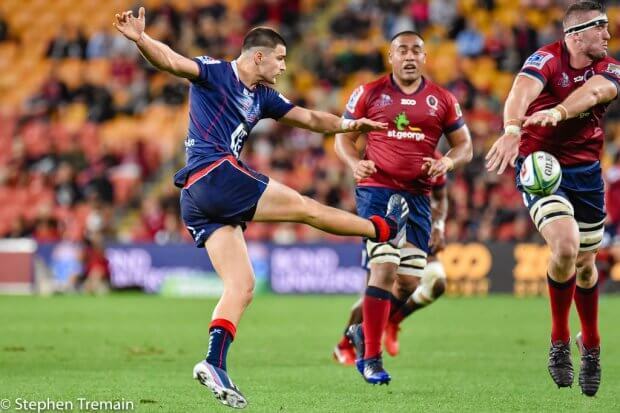 For the Rebels, of their 7 wins, 3 have been against Aussie teams and 2 against the Sunwolves. 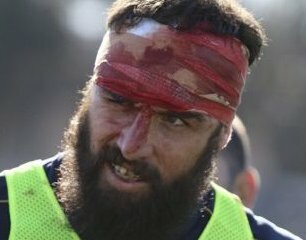 Both the Tahs and Rebels have each beaten one Kiwi and one South African team. Like I said earlier, it is a very real possibility that both of these teams could be in the finals. Last year the Brumbies were the only team to make it, and only because they topped the conference. With 34 points, they wouldn’t actually have qualified for the finals if it went on points alone. Speaking of points, the Rebels are on 35, on the verge of making the finals. Last year that would have put them 10th on the ladder. Hang on – the Rebels, with 35 points this year would have finished 10th last year, but are currently 8th. It looks like the new format has not only helped the Aussie teams improve, but equalled out the whole comp. The Kiwi teams are playing each other more often, taking points away from themselves. The Aussie teams are playing double the number of games against the Sunwolves, for the most part a points booster for us. In fact, the South African and Australian conferences are both getting more points than last year while the Kiwis are getting less. The result of all of these numbers, wins, losses and points? This year it is definitely a tighter competition and for the most point more competitive and less predictable. I wonder what the final round will bring us? So it’s a closer competition, less predictable, more tries and running rugby etc etc. So why are people still turning off? Smaller crowds, fewer viewers, less commenting in Forums as so on. It seems that, despite the changes SANZAAR and RA has made, people still just don’t care about Super Rugby. To be honest, I have definitely found my interest waning. I am not watching all the matches that have been recorded, I found myself kind of relieved that it was the last home game last weekend … I am even somewhat indifferent about the results and finals. Am I alone? From conversations I had with those around me I’d probably say no, I’m not. So why is it we don’t care as much? Is it that our teams keep appointing coaches, backing them, defending them to the hilt regardless of the poor results and lack of any identifiable vision and game plan they are giving us? Is it because we are watching some of our great young talent walking away because they are not being given the opportunities, consistently being left out for under performing “named” players? Is it because nearly every weekend we are seeing refereeing decisions which, whether correct to the letter of the laws or not, are ruining games. How many matches this year have been impacted red cards? How many times have we complained about TMO’s interfering/getting it wrong/not speaking up when we thought they should? I don’t know the answers. I don’t think anyone knows the answers. All I know is there are definitely questions that somehow need to be answered. But then again it could simply be one fact of life that rugby need to accept. It’s in the entertainment business and that mean it is all about popularity. SANZAAR, RA and all the unions / franchises can justify and explain it all they like, but it means nothing. Ratings and popularity are king and the rugby board rooms are simply out of touch. Which team has a coach they like or want or a game plan or playing style that is interesting and evokes some excitement? Do you tend to go to games to support the players and game overall or the franchise? Maybe it’s not as hard to work out what is wrong as RA make it out to be. The reality is JoJo Siwa can get more people to show up at a shopping centre than any Super Rugby game and she would probably be beneficial to any Rugby board in this country. Apparently she is entertaining and appeals to a certain targeted demographic. It would be nice if Super Rugby was appealing at all. Don’t necessarily agree that we are better off with 4 teams. In fact, I firmly disagree. 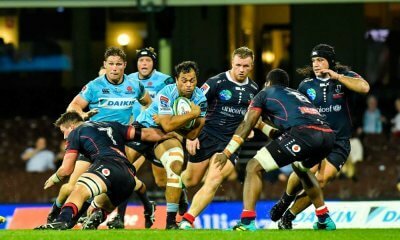 Our average level has improved in Super Rugby (a competition which is our biggest problem) at the cost of disenfranchising a large part of the country (and in reality reaffirming that it is an elitist sport for small pockets of the East Coast and a token team for the blazers in Canberra). We will still probably have one team in the finals, and that team was largely unaffected by the Force’s demise. I’d attribute their improvement to bringing in a top coach to their staff and also the head coach learning from a few years of mistakes. Our also-rans have improved though. “Is it that our teams keep appointing coaches, backing them, defending them to the hilt regardless of the poor results and lack of any identifiable vision and game plan they are giving us?” – Yes. Thanks, MST, always enjoy the TT5. As a Queenslander who now calls Melbourne home, I’m always a bit torn by the Reds vs Rebs matches… but I think you are probably being a bit generous to both of them. The Reds obviously did enough to win, but the Rebs did a lot more to help the Reds win. They were atrocious in all the moments that mattered. No leadership whatsoever, and Hodge is clearly not a 10. Which brings me to the ‘have the changes to SR been good for Australian rugby?’ question. Judging by the Reds vs Rebs game, you’d have to say no. Yes the Tahs have improved. But the Brumbies have arguably gone backwards. It doesn’t seem like there’s better player depth, and there certainly aren’t better crowds. Would it be any worse if the Force were still a SR team? Who knows. But at least we wouldn’t have disenfranchised a sizeable rugby community. It seems to me a Rebels–Brumbies merger would have been a much better option. – the arrogance of the RA board and their treatment of the entire rugby community through deciding to cull the west without any kind of open consultation. – the resistance of the established fiefdoms of the Reds and the Tahs to countenance a nationally run system to grow the game and make us more competitive. – the feeling these three little tin pot dictatorships will continue to preside over the decline of the game while they swill their chardonnay over lunch. – the officiating system is not serving the game and needs structural change with the inclusion of non referee input similar to the AFL. – the sad amateurism of Fox rugby coverage and commentary and all round promotion of the game. – the kiwis keep winning…..
IS i completely agree with the notion of disenfranchisement. To me it comes down to losing that link between grassroots feeder programs and the professional teams. We constantly hear about good interest and crowds at top tier club derbies in Sydney, Brisbane, Canberra and Perth also, so where I think RA is missing a trick is allowing those players to then take a step up to Super Rugby. I know for a fact when Super Rugby came on the scene one of the most exciting aspects and made for good engagement was seeing the club heroes and up and coming players from our local clubs having a go and excelling on the international stage. That allowed a bit of extra pride in the supporter base, e.g. if you were from Randwick and saw a young gun cutting it up, then get a crack at the Waratahs then your affiliation and pride in the Randwick guys would then flow over to the next tier and get you excited to watch them and the other guys perform. Now we are seeing these acadamy, so called next big things come from seemingly nowhere get a crack and we are wondering why people are not engaged? Look at Miller at the Tahs, club rugby legend (yes still young) but i bet a lot of that crowd on the weekend at the Tahs game were Norths supporters come to cheer on there former premiership winning captain. RA need to find a way to filter a few more of these club guys through the ranks, just because they are not from the “system” does not mean they cannot perform and join the system. Its like they are pig headed and saying we spent money developing this guy, not going to give anyone else a look in . There is a lot of good players out there waiting to be found, if only they could pull their head of the sand. This is a huge opportunity to both improve our performances as a national team in the long run and reinvigorate the rugby support base. But is anyone listening? I think part of Super Rugby’s problem is the conference. Apart from the fact that it’s unfair and rewards mediocrity (e.g. you can finish second or third and get a home prelim final against teams with MORE ladder points than you but who still have to travel to play you)… however it’s also complicated for people who aren’t rugby tragics. The casual supporter won’t understand how the final system works or why a team plays everyone except for two teams. Bring back the everyone-plays-everyone format. Simple. Fair. Everyone can understand it. The conference system works very well in all sports in the US, and no one have a problem to understand it. Are you implied that American are smarter then us? People can understand how it works if they take a few minutes to hear an explanation, they just don’t understand what the point of doing it is, and don’t want to bother with an explanation if they have only a casual interest. It appears just plain unfair at first sight, and then continues to appear unfair after it is explained. All the US comps have a single player market with salary caps, drafts etc. The conferences are far more equal in ability, and teams don’t get shifted as far up and down the tables. They generally don’t present teams in an overall table showing them out of order either. I would argue that their comps work well because of the various equalisation measures they have, not because of the conferences at all, which would become just as poorly received if they were regularly shifting teams with 8 wins above teams with 11. It took the US a long time to evolve their conference systems and for them to become accepted – on the order of 50 years for them to develop from champions of two leagues playing off post season to the modern system post world war two. No major sport in the US has ever had a single league round robin season followed by finals as has been the case for over 120 or so years in Australia. They have never had anything other than a plain round robin to compare with. SR has foisted one feature of a system which depends on many other things to work onto a population who have different traditions and are used to comps run well but in a different manner. Why? I’d like to see an American explain that. Playing devil’s advocate for a minute, which games (if any) do you make an effort to watch? I tend to make an effort to watch the games with the Kiwi sides in them if I can because, although there are exceptions, they’re usually more fun to watch. Even the Blues play with skill and passion, they just don’t do it as well as the other NZ sides. The lowly Blues have a 70% win rate against non-Kiwi opposition, that’s how bad a team they are! I think it’s slipped a bit this year. The Aussie sides can serve up a good game still, but it’s a bit hit and miss if we’re honest. Do I want to commit two hours to that? I don’t live somewhere that going to the match is an option but if it was, when I go to an international say, I’m looking at more like 6 hours to get there, watch the match, get in and out of the stadium and so on. If I lived near Wellington, Hamilton, Canterbury, Dunedin, I’d be there… Probably not every week but I’d know even if they lost if would be a good game to watch. Sure, the TMO can have an influence on that, and bad refereeing calls and so on. But the quality of play on the pitch matters too. In terms of points on the competition table, coming down to four teams has made a difference. The Rebels look better, and will hopefully improve again as they integrate their two groups of players better next year too. We can hope that Thorn’s influence at the Reds sees them continue to improve and they start to become genuine contenders every week next year as well. Perhaps things will get better, I hope so. But in terms of the eyeball test, the desire to watch Aussie Super Rugby teams, it’s not there yet – they don’t play well, they don’t play attractive rugby often enough to make me, and apparently a lot of others, want to tune in and watch them. I’ve actually watched more replays of Souths with QC playing for them than Super games this year. Definitely can’t be bothered to watch the Reds. Mostly have only watched the Super highlights packages. And they would be more enjoyable if any of them would ever include things like the scrums where Tupou destroys the opposition, instead of filling half the 3 minutes with goal kicks (yawn). Why does anyone ever show kicks at goal as a highlight? Sorry, I’ll take that back, there are some spectacular ones that probably deserve to be there, but mostly not. QC definitely has an x-factor that makes you want to watch him, agreed. You might watch him and want to strangle him, but you definitely want to watch him. The Reds are starting to remind me of Mark Hammet’s tenure at the Canes, I’m thinking if they do stick with Thorn for a few years they will see an improvement. It might not materialise until the next coach though. You could well be right. I think Thorn has done enough to get at least one more year. There are distinct signs of improvement over the season to my mind. That said… this is the Reds and they’re a pretty dysfunctional organisation, so he could be looking for a new job really soon. I hope they’re smart and keep him long enough that he sees the rewards for the foundations he lays. Do you mean Hammett’s career at the Hurricanes? They kept promising and not quite delivering, he went to Cardiff and suddenly the “Canes start winning but with the team he built. Hammett’s time at the ‘Saders was as assistant to Deans, then he went off to the “Canes according to Wikipedia. Personally I think the “Saders made a mistake letting him go. I’m not a big fan of Blackadder (he took a franchise that couldn’t avoid winning under Deans and never won… he leaves, they’re back to winning ways). But… Hammett might be a better assistant than head coach/DOR too. The foundations he laid at the ‘Canes were really strong but those last little bits weren’t there. Likewise at the Blues (sorry, that’s the Cardiff team’s name too, lots of room for confusion) they’ve improved but they’re not quite great (they are up against the rampant Irish provinces mind). There is a definite place for brilliant assistant coaches mind you! Thorn might turn out to be a better Forwards Coach than Head Coach but I think he’s started with his forwards because he’s more comfortable there and felt he could fix it faster. When that’s firm, he’ll work on the backs. That’s next year’s project. But we’ll see if he can pull it off or not. I’m thinking the Reds might win 9-11 games next year, 10 games would put them up with where the ‘Tahs are likely to end this season, give or take some bonus points. So that’s a decent chance at winning the conference. That relies a bit on his core players staying fit, some more experience and good coaching, but I think the way their scrum has improved from last year, he’s got it in him. I agree with your points. I know a lot of Canes supporters or Kiwis don’t like or appreciate Hammett, I certainly didn’t when he got rid of Hore and Nonu etc. But he did turn around the attitude and resolve of his young team and brought up guys like Coles and Barrett to become test quality players. To me, Blackadder was given far too much time and the Saders seemed to bleed assistant coaches. Robinson is on another level though and I think they should hold onto him as long as possible. As for Thorn, I think the reds need to do some savvy recruiting or something because they just don’t have enough class players in the key backline positions. And with QC on the sidelines, Thorn needs to either provide and equal or better option at 10 or dine on a bit of humble pie and pick him. I definitely agree that Hammett deserves a lot of the credit for the emergence of Coles and Barrett senior and letting Hore in particular go was probably a mistake. 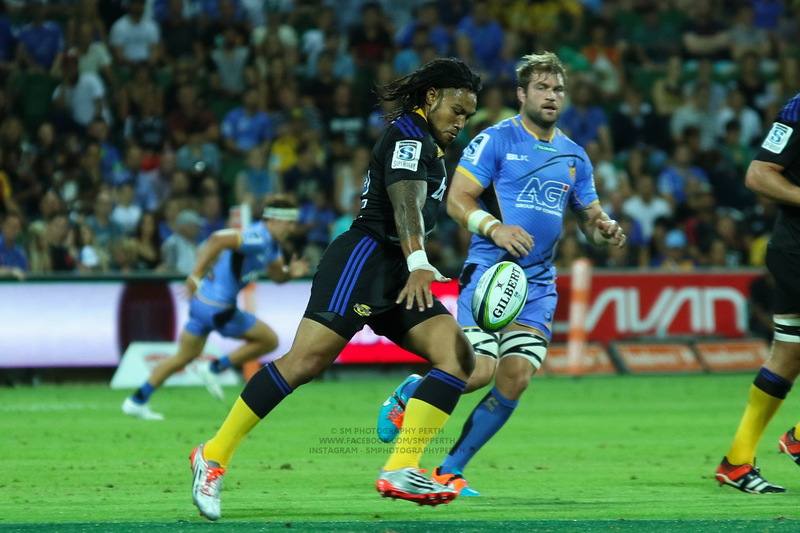 Nonu… he rarely rarely delivered much for anyone at Super Rugby level in fairness so I could understand that more. I’m not sure how much Thorn needs to recruit and how much he needs to work with what he’s got in the backs – a bit of both I think. He’s got some players who are now a bit seasoned and if they’re buying in to what he’s selling and he can get someone in to work with them ought to be able to improve a chunk with some good coaching. But some of them still look a bit like rabbits in the headlights too often. Not every week but too often. I’m not sure whether he’ll think he should replace them or he’s genuinely seeing enough to think they can be coached up to be decent players. As for Robertson, the ‘Saders tend to keep hold of head coaches, good or bad. I suspect they’ll keep him until he moves up a level. Next year might be too soon for him but if Gatland does take over from Hansen he’ll be 58 in 2023 and he’ll have been an international head coach for 16 years on the trot in two of the most febrile rugby countries on the planet. I can see Gatland doing well, he’s a class coach and, much though it pains me to say it, he’ll have access to higher quality players than he’s routinely had in Wales, but I can see him choosing to step down in 2023 too and go gracefully into retirement. At that point, assuming Robertson keeps doing as well as he’s done last year and this so far, he looks like the next All Blacks coach to me. He’d be 49 in 2023 by the time of the RWC. Assuming he’s got the appetite and has the success he could keep going for 12 years and still retire without being really old. Well I watch all of the Brumbies games, attend all home games, but this year the losses haven’t hurt as much. It’s been a bit more of a “meh, we lost”. I went into the game against the Crusaders thinking that we were going to lose, but at least we’d see some good rugby from the Crusaders (and they then proceeded to have one of their worst games of the year and it was terrible to watch!) As for matches with other Aussie teams, I watch them but it isn’t uncommon for me to be doing other things at the same time (reading/keeping kids distracted etc) so I’m not always glued to the screen. If it’s a close game I’ll pay more attention, but sometimes it’s just background noise. The basic errors, poor handling, poor kicking options that all the Aussie teams seem to have just frustrates me. I do try and watch the Kiwi games because I enjoy the way they play. The games are usually pretty good and their skills still seem a step above what we see in the local derbies. I have hardly seen any of the SA games, we record them all but rarely can be bothered to watch them. I think RA did major damage with not only the decision to cut the Force, but the way they went about it. A lot of people just lost interest and I don’t know that things will recover that quickly. As I mentioned above, sorry for the late reply. My internet has been down. I salute your dedication. I’m not a Brumbies’ fan and even during their best years I wouldn’t have watched every game. I do remember the ‘Saders having an off day against them, that must have really rubbed salt into the wound. But outside that, you’re kind of making my point… you have the matches with the other Aussie teams on but in the background. You actually try and watch when the Kiwi teams play because they (usually) play more attractive rugby. It’s hard for me to judge how much ill-will the Force situation has built up, I’m a long way away. I would expect it to decline relatively quickly… but there seems to be a lot of resentment aimed at the “RA Old Boys Club” and the way they killed off the Force brought a lot of that from a simmer to a roaring boil again. It’s not cooled down yet, and some of the appointments since then have kept the fires stoked (even if in other years they might be considered OK). But it might well be keeping the numbers down with the disgruntled fans. Thanks for the five, MSTs. There’s a mystery surrounding Maddocks’s haircut. Was it done in the dark by a housemate while he slept, or did he pay for it in broad daylight? Either that or lost a bet, or had a nest of nits just around his ears. C- after we almost beat the second best New Zealand team in Hamilton? Righto. Based on the second half of the season I’d suggest they’re better than the Hurricanes right now. Maybe. We’ll find out over the next two weeks when they play each other consecutively. Although I suspect round one will involve some shadow boxing and rested players. Yeah, the conference system is hell. Maybe. I guess we’ll see. Chiefs’ tight 5 just look more threatening to me. I think once the broadcasting rights have finished it will be interesting to see if SANZAR get disbanded. Hopefully RA and NZR decide to create their own comp. Bring back the Western Force and it’ll be a 5 teams in OZ and NZ playing a home and away comp, or add a few byes and play some home and away games missed in the following year. No one want’s an over complicated format. Also Fox is not going to let go of their strangle hold on Rugby but hopefully they can telecast some of the games on free to air just like AFL and NRL. Rugby is slowly dyeing, grass root numbers are dwindling, Rugby desperately needs more exposure. Yes, we are better off with 4 teams, but for how long, essentially the Force were merged with the Rebels, you were always going to get a better team. But you have sacrificed approx 20% of your support base to do it, and just dumped a pathways for players that you had spent 10 years developing. The question is will you be better of in 5-10 years. Good call on the final knock-on in the Chiefs V Brumbies game. After almost everyone calling for less TMO intervention, I couldn’t believe the way that a lot of media outlets including Nine and Fox Sports carried on. > for those who are not seasoned supporters/die-hard rugby nuts, would you even know its on? There’s next to no public advertising, and if you don’t have Foxtel, there is no advertising. > World Rugby/SAANZAR/RA/other need to look at the overall impact of the referees on the game. Sure, I’m 110% behind making the game safe for players, but referees are killing the game. Its the constancy bloody stopping to look at EVERYTHING. I’m a fan of the on-field ref’s “on-field try but please check touch” as it hands back the game to the on-field ref like it should be, with the main bloke the main bloke and the 2 touchies and the TMO as extra sources of information. > let’s try advertising the game to the general public – bus-stops, internet, FTA TV ads, maybe having a replay of a match weekly on FTA TV?